A few days ago we have posted a windows binary compiled from the latest source of ccMiner 1.7-git from tpruvot and now the official 1.7 release is available with a windows binary compiled by the author of the miner. The final version does come with some additional fixes and improvements as compared to the 1.7-git release from a few days ago, so if you are using the older windows binary you might want to update now. 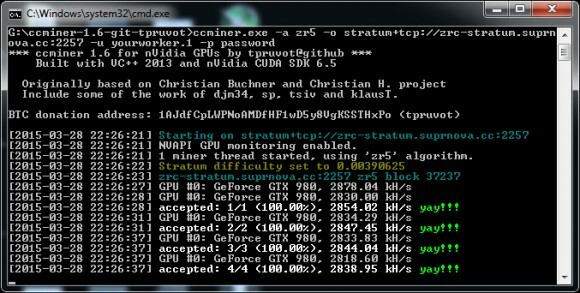 The ccMiner 1.7-tpruvot fork brings support for old Compute 2.0 (SM 2.1) devices for many of the crypto algorithms allowing users with older Nvidia GPUs to use them to mine. It also brings some performance improvements for newer Compute 5.0+ GPUs and adds new features such as automatic benchmark mode for all supported algorithms and some other interesting new features. 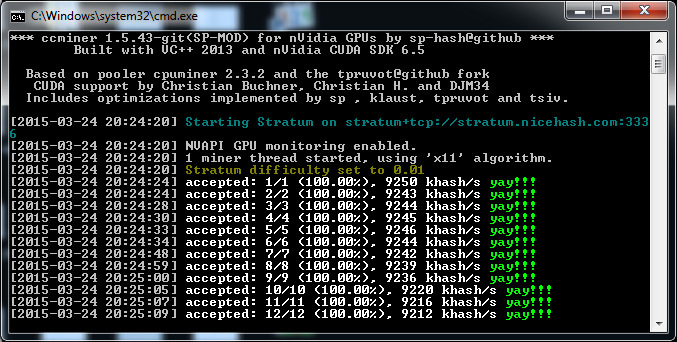 The ccMiner 1.7-tpruvot fork supports Nvidia-based GPUs with Compute 2.0 or newer capabilities, so make sure that you are not trying to run the miner on too old hardware. The official x86 Windows binary release is for older SM 2.1+ devices while the x64-bit one is intended for newer SM 3.5+ devices. We have compiled a new windows binary for the ccMiner 1.6-git fork by tpruvot (source) that now has support for ZiftrCOIN (ZRC) GPU mining with support for Compute 3.0 or later Nvidia-based video. Our windows binary is compiled with VS2013 and CUDA 6.5 and supports Compute 3.0, 3.5, 5.0 and 5.2 GPUs, you can download and try it below, there is an example BAT file setup for testing hashrate at the Suprnova ZR5 pool. Depending on the GPU you are using you may try to increase the intensity of the ccMiner to get some extra performance, try with 25-26 instead of the default 20. We are getting up to about 3000 KHS on GeForce GTX 980. The GPU mining availability for ZiftrCOIN is going to make CPU mining the coin pointless, especially since it is now possible for both AMD and Nvidia GPUs, so you might want to switch to something else if you have idle CPU power for mining crypto currencies. 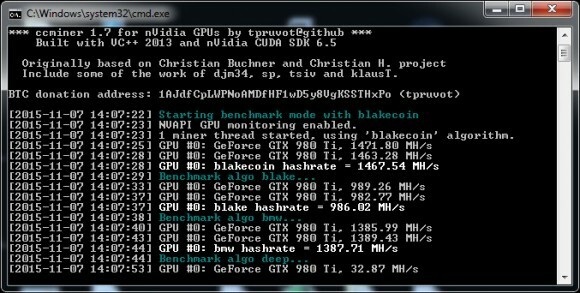 A new Windows binary compiled from the latest source code of ccMiner 1.5.43-git SP-MOD fork of the Nvidia GPU miner optimized for the latest Maxwell-based video cards by SP (source). The latest version comes with some fixes and some small performance improvements in multiple algorithms. The SP-MOD fork is designed for running on Nvidia Maxwell GPUs such as the already available GTX 750, 750 Ti as well as the newer GTX 960, GTX 970 and GTX 980. The windows binary release we have made available here is compiled with support for Compute 5.0 and Compute 5.2 GPUs or with other words only for Maxwell-based cards with CUDA 6.5 and VS2013.